This review is going to examine Super Beta Prostate, one of the many supplements on the market that seek to offer relief to men who are suffering from prostate complications. 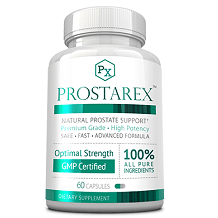 The supplement claims to enable men to maintain a normal prostate function that helps to reduce the number of times one has to frequent the toilet. It is also credited with the ability to improve the overall health of the prostate and improve bladder emptying. In the end, consumers enjoy better sleep and rest at night. The aim of this review is to objectively examine these claims and furnish you with the facts as they are. Keep on reading to learn more. Other ingredients include stearic acid, microcrystalline celulose, croscarmellose sodium, magnesium strearate, pharmaceutical glaze( shellac, povidone). The most beneficial ingredient in this product is beta-sitosterol. This ingredient is known to provide relief to urinary symptoms due to prostate problems. The other ingredients work together with beta-sitosterol to ensure a healthy prostate. The recommended usage of Super Beta Prostate is one caplet twice a day with meals. It is advised to take one in the morning and another in the evening. It is recommended to take the product for at least a month to see any improvements. The manufacturer maintains that the supplement is natural and it has no side effects. The only caution they give is that if you are taking prescription medications or have other health conditions, you need to consult a doctor before taking the remedy. This product contains soy and shellfish so if you are allergic to these ingredients then you should not take the product. Buyers can purchase the remedy online from the manufacturer for the entry price of $6.99 that covers the handling and shipping costs. The offer includes a one-month supply. If you wish to continue with the subscription, the company will bill you every month at the cost of $39.95 for a monthly supply plus $6.99 to cover handling and shipping costs. You will need to cancel within the first month if you don’t wish to be automatically billed. Super Beta Prostate comes with a 30-day manufacturer’s money-back guarantee. The compensation excludes shipping and handling fees. However, for the first 30 days, you are just trying the product out and you haven’t actually laid out any money. The manufacturer’s website has no verified reviews, but we saw 522 consumer reviews on Amazon. The customer reviews gave the product a 3.8-star rating out of a possible 5-star approval. This review reveals that Super Beta Prostate is just one of the many prostate health supplements on the market. It seems to contain beneficial ingredients for ensuring a healthy prostate. It also claims to not have any adverse side effects. However, the way to go about buying the product from the manufacturer is unappealing. The fact that you have to sign up to be automatically billed may allow for transactions to go through without the buyer’s permission. Unless you read the small print, customer’s may not realize this.